As I've eluded to previously I gave up on Firefox 3.5.x on my MacBook Pro OS X and FreeBSD partitions because it was far too unstable to use without going bat crazy insane. I left Windows for a reason! 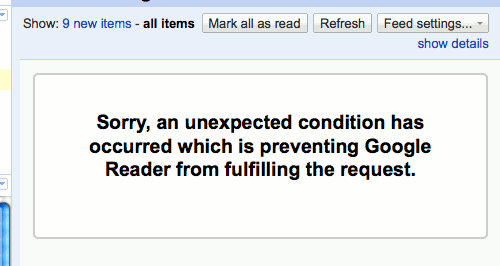 For some reason though going back to 3.0.x has caused Google Reader to generate a few errors a day after not having any trouble at all. It could very well be a problem with our home internet connection here not Firefox but it is a weird coincidence. If it weren't for the fact all my friends from Twitter, Whole Wheat Radio and the real world used it I'd probably go back to Bloglines full time. In fact at one point I was going to research whether I could subscribe to people's Google shared items and comments in Bloglines and have people subscribe to my Bloglines shared items and comments from Google Reader. Might be worth looking into again. Older post → When NOT to use Java’s array.length method!